As part of our varied services, we can provide Corporate Displays of our birds, both flying and static. 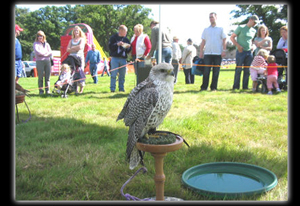 If you are organising an event and wish to have something different as your centre piece, then why not have a magnificent birds of prey display? We are experienced in providing displays at for Corporate Events, as well as castles, shows, fetes and can tailor the day to your requirements. 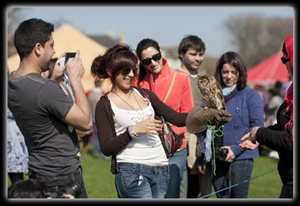 Our static displays allow people to get up close to admire our wonderful selection of birds and to speak to the falconer who can answer any questions that they have about the birds. We will bring a varied selection of our birds including hawks, owls, falcons and eagles to show how different and pretty birds of prey are. Our flying demonstrations which can by from any of our birds will amaze the young and old alike with their dives and swoops. We put our birds through their paces and show how each bird flies whilst giving an informational talk about the bird itself. Give your guests or employees something to talk about and get in touch with us to discuss your needs and to get a quote! Please include the prefix if outwith the United Kingdom, thank you.